I don't go to a lot of comedy shows, mostly because my busy theater schedule doesn't allow it. But I couldn't resist a night of feminist comedy hosted by Raw Sugar (aka Jenny Moeller and Rebekah Rentzel), a company that "makes adventurous and imaginative projects driven by women." 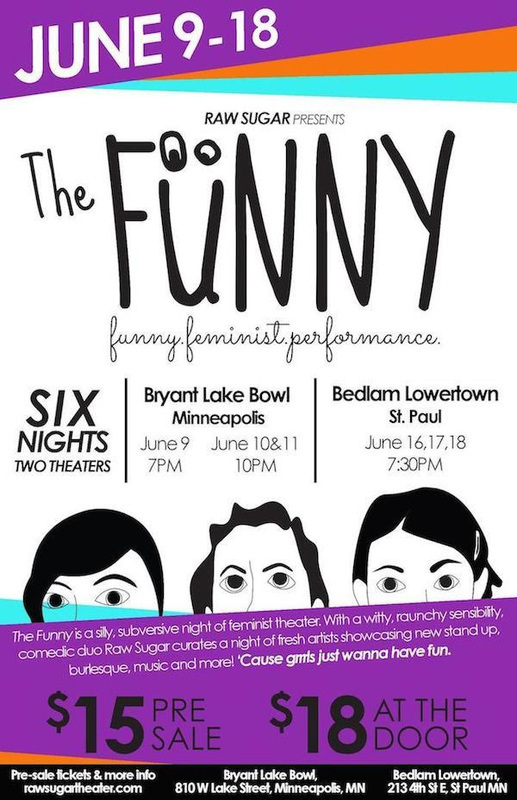 They and their friends performed their third installment of The Funny at Bryant Lake Bowl in Minneapolis last weekend and continue at St. Paul's Bedlam Lowertown this weekend. It's a fun evening of comedy that ranges from the grounded and relatable to the crazy and over the top, with a few poignant moments thrown in as the artists explore what it means to be a woman/trans/femme in our patriarchal world. On the night I attended, the show was hosted by everyone's favorite Aunt Flo (Andi Cheney), who introduced the dozen or so acts and told a few jokes of her own. There's a little something for everyone, whether you like food humor (Jenny and Rebekah, Andrea Fairbanks), or spoken word (Akiko Ostlund), or dance (Akiko again), or thoughtful affecting short films (Ifrah Mansour), or empowerment camp (Anna Johnson and Lucy Roberts), or funny and poignant drag (Tender Vittles aka Scott Artley), or a hilarious trip-tease (Paige Collette). My favorite pieces were an essay about cat-calling in the US vs. South America by Sarah Parker, Fringe favorite Rachel Petrie's very funny "Guide to Rest and Relaxation," and Shannon Mae Leach's new take on a period romance novel. 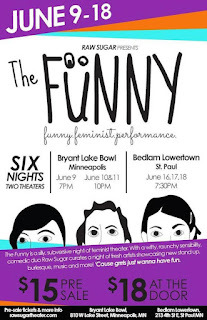 There's only one night left of The Funny so head to Bedlam Theatre's bar/restaurant/performance space in Lowertown St. Paul (directly in front of the Union Depot Green Line stop) to watch these funny, smart, silly, strong, beautiful, brave women (and men).